Code migration is a potential way to renew systems. If a company is generally happy with the functions and possibilities offered by its information processing systems but the technology being used has slowly become outdated (e.g. Cobol, Pascal, Delphi, etc. ), a code migration can often be the right solution. Although we will not be covering all the challenges associated with a code migration or any other technology changeover at this point, there are without doubt various stumbling blocks when attempting to ensure the quality of such a project – not least because these types of tasks are usually planned as very large and critical projects, metaphorically akin to open-heart surgery. And during heart surgery in particular, it is especially important to ensure that all organs are supplied with blood and oxygen at all times. Since companies also aim to receive a permanent supply of their own kind of blood and oxygen (i.e. complete and correct data), special attention must be given to data quality during a code migration. OMrun is often used as a kind of quality gate during a code migration (as well as during data migrations). To ensure that the applications which are renewed in this way function exactly the same as the existing systems, OMrun is used to perform an automated, rule-based reconciliation at data level. Preparatory data-processing transactions are initiated manually or automatically. OMrun then accesses the databases of the existing and renewed applications, checking whether the triggered processes have generated the expected results. A detailed report is then generated from this data reconciliation. Any differences found during this check serve as the basis for making corrections during the migration. The process is repeated until no more (prohibited and/or unexpected) differences are found between the existing and migrated application. This automation accelerates the correction cycle considerably and eliminates the risk of the renewed application producing undetected erroneous data. 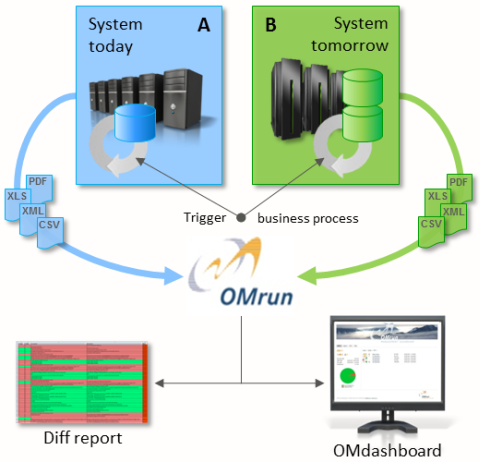 This application scenario represents one of the most common and beneficial uses of OMrun. For reference details, please contact us – we'll be happy to put you in touch with the relevant project staff.